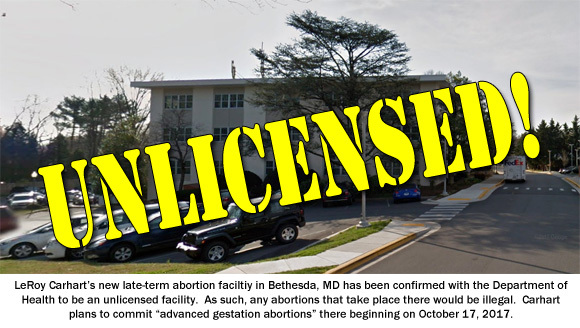 Bethesda, MD – Operation Rescue has received confirmation from the Maryland Department of Health and Mental Hygiene that the new late-term abortion facility located at 10401 Old Georgetown Road, Suite 104 in Bethesda, Maryland, is not licensed as an abortion facility as required by state law. That means any abortions he plans to do beginning on October 17, 2017, would be illegal. Meanwhile, local and national pro-life leaders plan to hold a press conference outside the illegal Bethesda abortion office on October 17, 2017, to announce further plans to oppose the dangerous new facility. Details to follow.